The F14 T is Ferrari’s answer to the new 2014 technical regulations and at first glance appears to have significantly different features to that seen of its already-revealed rivals. 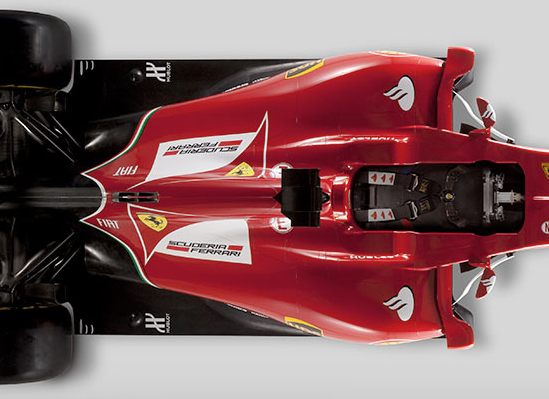 This piece aims to break down exactly what Ferrari are trying to achieve across the entire length of the car. 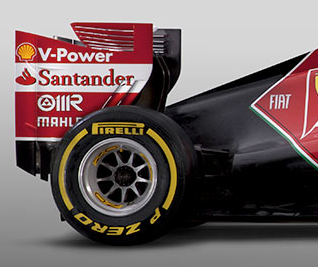 Starting with the most obvious point: Ferrari have not opted for the “finger” nose. Although this would seem to be a conservative choice for the Scuderia, its design is far more comprehensive than at first glance. To meet the 9000mm2 cross section requirement, the nose is a thin, wide structure that reaches slowly backwards and upwards. Once the cross section meets the line that marks the base of the front bulkhead, the top of the nose expands upwards and outwards to meet the chassis. By doing this, the oncoming airflow is allowed to pass around the nose with relative ease, travel down the sides of the chassis and possibly into the leading edge of the floor below. This process is aided by two camera pods, mounted ahead of the front suspension, that act as splitters. Speaking of the chassis, Ferrari have not gone for a stepped route (as discussed here) although it is a very similar approach. The chassis starts at its maximum specified height of 625mm above the reference plane, before swooping aggressively down to the 525mm front bulkhead height. This creates the illusion of a stepped chassis with a vanity panel covering the step along the top. 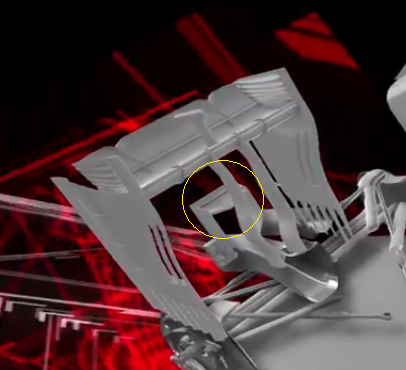 However the image above (showing the F14 T chassis in its bare form) shows that the profile of this section of the car is one continuous curve. This design allows a little more room beneath the chassis for airflow to pass into without the violent step that would otherwise be created using the aforementioned layout. Moving back to the nose design, the pylons are space as far apart as possible and look similar to those on the MP4-29 released yesterday. The pylons themselves are extended towards the rear of the car which, coupled with the small letterbox that the nose tip height forms in conjunction with the front wing main plane, creates a thin area for airflow to pass through. This area produces a venturi effect, creating low pressure airflow directly beneath the car’s nose. Although the obvious advantage of this is a gain in downforce, the fast flowing airflow exiting this area will allow a higher volume of air to pass into the leading edge of the floor. 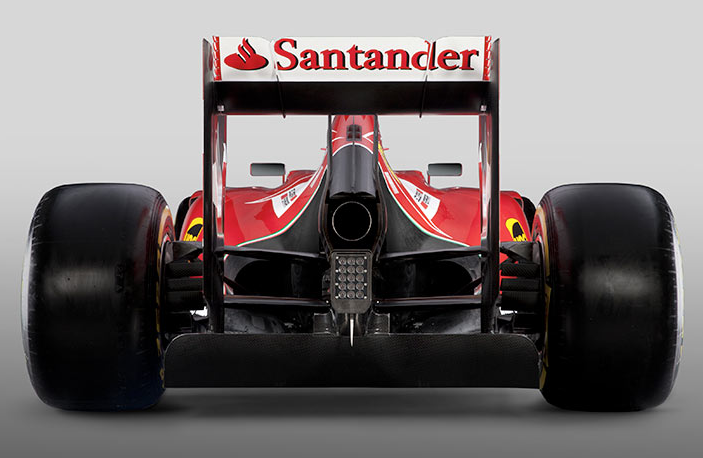 There are therefore a few advantages that this nose layout has in comparison to the “finger” nose. Moving onto the front wing itself, it appears to be a launch version-only specification, although it may get a few days of testing for initial mileage. The wing is a bit primitive, with only four elements and very basic cascade winglets. Expect more to come from this area of the car. Note that Ferrari have retained their pull-rod front suspension, despite evidence to suggest that it is not the optimal setup for tyre management. Although the aerodynamic gain in using a pull-rod layout last year is somewhat negated due to the lower chassis height, the flat bar it creates is still beneficial in some aspects. 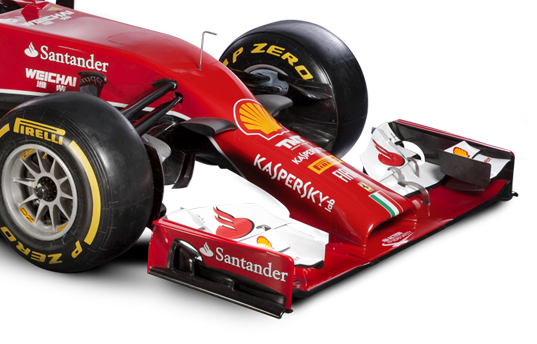 It is in this area of the car that Ferrari have really started upping the ante. They are visually much more enclosed than those already seen on the MP4-29 and the images of the Williams and Force India cars. Whether this translates into a performance advantage remains to be seen, although the lack of noise from Ferrari’s power unit department could speak volumes about the progress it has made with its V6 turbo hybrid. The distinctively slimmer bodywork resembles that seen on Red Bulls of the past, with the base of the ‘pods tapered outwards and the whole profile heavily shrink-wrapped around the internals beneath. The sidepods are very rounded which leaves a lot of opportunity for airflow to be manipulated in such a way that it reaches the floor of the car very easily. Ferrari have realised this by placing a horizontal blade above each sidepod air intake, each connecting to their respective airflow conditioners that flank the car. The blade is designed to produce a downwashing effect over the sidepod, guiding airflow towards the top of the diffuser and also the gap between the floor and the rear tyre. This is a potential development opportunity as, although the Exhaust Blown Diffuser effect has gone, vortices can still be produced (via fences/scrolls) in this region of the car to offset the turbulence created by the motion of the rear tyre that impinges on the diffuser directly next to it. The sidepods taper inwards very quickly, although there are two heat outlets (one each side of the car) that create a small overhang for air to pass under. The outlets exit in parallel with the central exhaust between the upper and lower wishbones. Although the rear wing is an all-new design in terms of its main profile (20mm shallower than in 2013), only a few subtle changes have been made to the endplates. The horizontal slots that prevent vortex build-up at the wing tips have been reconfigured to a solution seen on previous McLarens, whilst the leading edge of the ‘plate gains an additional ‘tyre squirt’ slot, bleeding off turbulent airflow projected off of the rear tyres. Further changes have been made to the rear segment of the endplates, with just one vertical slat and multiple perforations made to the lower half. These cutouts help expand the airflow coming out of the diffuser and rear brake ducts, which in turn forces the low pressure region beneath the rear wing to work harder as a result. An intriguing decision has been made to mount the rear wing via two central pylons, rather than extending the endplates to the top of the diffuser. This saves a lot of weight but is less aerodynamically beneficial. The central exhaust exit protrudes between the two pylons and a Y100 (Monkey Seat) winglet will be installed on the car for testing, despite it not being visible on the launch car. The winglet was evident in a video clip released by Ferrari during the launch event, showing the winglet mounted above the exhaust and behind the two pylons. This rearward shot also reveals the small outlets on the engine cover, further providing cooling to the power unit below. In comparison to the cars we have already seen, the F14 T appears to be very minimal on inlets and outlets so perhaps Ferrari have designed a much more heat efficient number beneath the red bodywork. The rear wishbone has been placed slightly more rearward, possibly to attempt to emulate the loss of the beam wing. Ferrari have also retained their enclosed half shafts, housed within the lower wishbone, whereas the other cars we have currently seen appear to have taken a step backwards in this area by exposing them once more. As with most car launches, it has become customary to cover up the diffuser away from the prying eyes of the media and the F1 world. 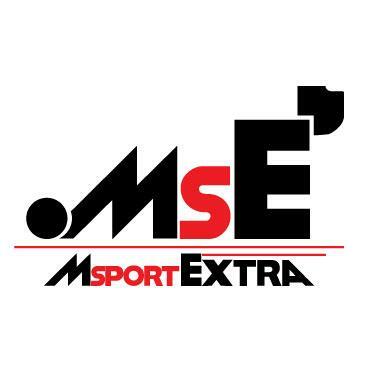 All shall be revealed in Jerez, just a few days away. This entry was posted in 2014 Launches, Car Launches and tagged 2014, analysis, car, f1, f14 t, ferrari, launch, technical on January 25, 2014 by thewptformula.